You can never have too much storage space in a home, especially if you tend to collect belongings. While most home storage is designed to be purely functional and often hidden behind a closed door, one area of your home where you can invite some luxury into your storage is the master closet. Organization – You’ll want plenty of hanging space for your clothes, and the standard shelf and rod is not going to cut it for a well-organized space. Custom-designing your closet with built-in storage that can efficiently display shirts, pants, suits, and dresses organized in color stories, will make your primping experience much more pleasant. This usually requires multiple shelves and hanging areas expertly spaced to make the most of the square footage of the closet. 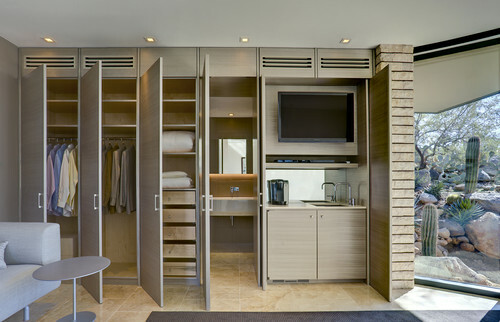 If you have ample space your master closet providing multiple drawers will free up floor space in your master bedroom! And if you must share with your husband (and most of us do) provide him with tie/belt hangers and built-in shoe racks to help keep the closet from becoming haphazard and disorganized. Seating – Comfortable seating is an absolute must! Use a cushioned bench or a full sofa chair, depending on the space available to you. Not only does this give you a quiet spot to relax, it also makes it easier to put on your shoes in the morning. Lighting – In addition to having general overhead lighting, consider track lighting to focus on your actual wardrobe. Wall sconces are another wonderful option for getting more light into this room. Don’t stick with standard light fixtures, either; luxurious fixtures like an overhead chandelier can go a long way toward an incredible-looking space. Full Length Mirror – You don’t want to leave your home with a missed button or a flipped collar! Full-length mirrors are a must for checking your appearance before you head out. Choose one with a frame so that it looks like a piece of art in your closet. Vanity – Include a vanity that can be used to apply makeup and put on jewelry. Ideally, the vanity will have its own lighting and a cushy seat as well as a well-organized drawer for holding your jewels and makeup. TV – A TV in the closet is a great way to know what weather and traffic to expect from the day as you’re getting ready. No more running back inside for that jacket! Coffee Station – For extra convenience, install a coffee bar nestled into a corner of the closet, especially if you’re like me and can’t live without those early morning cups. For additional design tips and ideas for your home, be sure to visit me online at Interior Makeovers, Inc.. or call us at 310-788-0990. I’d love to help you create your ideal luxury closet space.